La Cofradía del Santo, es fundada por D. Pedro Nazar, Obispo de Calahorra y Nájera, juntamente con Domingo de la Calzada. The Brotherhood ¨Cofradia del Santo¨ was founded by Pedro Nazar, bishop of Calahorra and Najera together with Domingo de la Calzada. It was put together in 1106 under the authority on an abbot. The first prior was the bishop himself. Domingo de la Calzada was named Prior when the bishop passed aqay and the following Priors were Juan de Ortega and Don Nuño who performed the functions of Prior during 1120 when Alfonso I (el Batallador) reigned. The Brotherhood was first named ¨Brotherhood of Saint Mary and the Saint¨ then changed its name to the actual one. The Brotherhood had its headquarters in the old Hospital (today Touristic Parador). The building used today was bought on January 19th of 1968 and opened on the 10th of May of the same year. Later, in 1991 the market occupying the ground floor and the adjoining building were purchased. The General Assembly of ¨brothers of the Saint¨, highest authority, is formed by more than 2000 members. The Council of Canons is formed by the Brotherhood of the year: Prior, abbot, secretary (with a partial say) and the last 10 Priors as well. Resemble the virtues of the Saint and Founder by encouraging his worship via religious traditions which help to keep the memory of Santo Domingo alive. Look after the alberge and after the pilgrims to Compostela, continuing the labor of our Saint, promoting cultural activities (ceremonies, speeches, expositions) etc. The alberge is assisted by the Brothers of the year (Prior, lawyers and religious administrators) who establish weekly shifts in order to attend pilgrims and maintain the installations clean. They are also helped by the volunteering hospitaleros. This wooden box covered with zinc is guarded by the Prior in his house and each year, on the 10th of May, it is taken in a religious procession to the alberge where it stays until the 13th of May. As soon as the new brotherhood of the year is named the box is taken to the house of the new Prior. BROTHERHOOD OF SANTO DOMINGO DE LA CALZADA – INVENTORY CERTIFICATE – J.H.S. – LONG LIFE TO THE SAINT – BROTHERHOOD´S STAMP. INVENTORY CERTICICATE, REVIEWS, NEWSPAPERS, ETC. 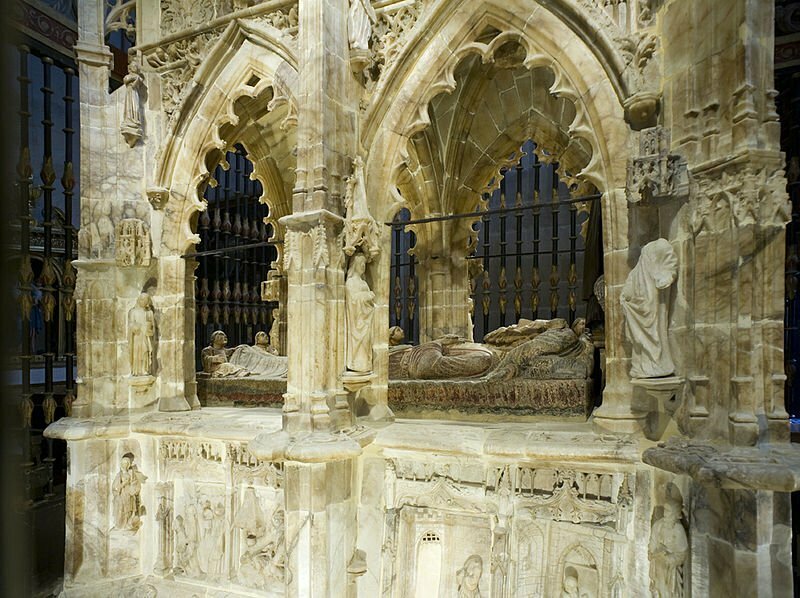 DATED BACK IN 1909, 8TH CENTURY AFTER THE DEATH OF SANTO DOMINGO DE LA CALZADA, CONTENTS OF A BOX THAT IS CLOSED TODAY AND TO BE REOPENED IN 2009 ON THE 9TH CENTURY ANNIVERSATION, CONSIDERED A MODEL AND INCENTIVE. June 15th of 1933, HOLLY CORPUS CHRISTI, 17:00 o´clock. 6 packs of cigarettes, 20 pieces each with the inscription: GIFT MADE BY THE CANON ANGEL MANSO TO THE INHABITANTS OF SANTO DOMINGO DE LA CALZADA IN 2009. 1 pack of 12 cigars with the inscription: 1909. CIGARS GIVEN TO THE PILGRIMS OF VILORIA ON THE ANIVERSARY OF THE 8TH CENTURY AFTER THE SAINT´S DEATH. 31ST OF MAY, 1909. ANGEL MANSO. SEALED. 1 bread of the Saint of the ones shared out by the Prior to the people of Santo Domingo de la Calzada, Cirueña, Ciriñuela, Manzanares, Gallinero and Corporales y Morales in 1909. 1 bottle of the wine used for the celebration of the masses during the festivities of the 8th century anniversary in 1909. 1 bottle of Benedictine served to the pilgrims in Viloria de Rioja in 1909, on the 8th century anniversary. 1 small box containing wafer used to decorate the wheel in 1909. 17 editions of the ¨Diario de la Rioja¨ newspaper. The editions of 2,3,6,7,9,12,(3),14,15,16,18,19,20,22,25 of May and the one of the 2nd of June of 1909. 1 edition of the ¨La Rioja¨ newspaper dated May the 2nd of 1909. 1 copy of the sermon pronounced during the mass on the 12th of May 1909. 5 programs of the festival celebrated in 1909. 1 copy of the Saint´s hymn. 1 book about life and miracles of the Saint. 2 notebooks with a register of all that has been done during 1909, made by Angel Manso Armas. Other documents of the Brotherhood and committees of the 1909. 45 golden pesetas and 6 silver ones used to pay the 9 masses to be celebrated in 2009, the 9th century anniversary for the souls of the brothers of the Brotherhood in 1909, for all the other brothers who helped to gather the gold whose names are written on a list inside the box and for Angel Manso. The rosary beads from the statue of the Saint worshiped before the one worshiped today. This rosary beads were donated to Joaquin Manso in 1789 when the statue was changed then. It was put in the box by Angel Manso, D. Joaquin´s great-grandson. This box was donated by Angel Manso Armas, canon of the Saint Church the Cathedral of this town with the objects described. (EXEPTING THE GOLD AND SILVER WHICH WAS DONATED AS REFFERED ABOVE) ALL THE OBJECTS PUT INTO THE BOX IN 1909 BY MR. MANSO HIMSELF WHO ALSO WROTE THE NOTE MENTIONED ABOVE. It was kept by Angel Manso until a few years ago, when gave the box to the Brotherhood with the purpose that the Brotherhood passed on to each Prior until 2009, when the 9th century Saint´s anniversary. AFTER ALL THIS IS READ BY A SUBSCRIBER AND OUT LOUD BY THE SECRETARY WE CERTIFY AND ACTED ACORDINGLY WE SIGN IN THE MENTIONED TOWN, HOUSE AND ON THE ESTABLISHED DATE. Signed by the abbot Idelfonso Velasco, the canon Angel Manso, the Prior Austin Garcia, the Old Prior Julio Garcia, attorney Jose Fernandez, attorney Nicolas San Martin, religious administrators Salvador Rubio, Marino Pinto, Lazaro Gomez, Maximo Arenas and by the Old Priors – Maximo Aransay, Valero Angulo, J. Manuel Alonso, Graciano Rioja, Victoriano Marin, Cesar Marin, Juan Cruz Capellan, Raimundo Camara, Francisco de A. Ferrer, Felipe Gil, Fidel Ruiz de la Cuesta del Rio, Miguel Camara, Miguel Angel Capellan y Julio Navas Madrigal. During the annual transfer of the Box the Prior who receives it must sign a document swearing under oath to guard the Box and declare that it had been received in good condition without any sign of having been forced.